Hi guys! You know how I find inspiration for my nails in the weirder things? Like blankets? Well I've got another one of those today. But now I can show you the inspirational object as well, because it's a necklace! My eye fell on this pretty little thing in the drugstore, and I thought it was so cute (and discounted, yay!). 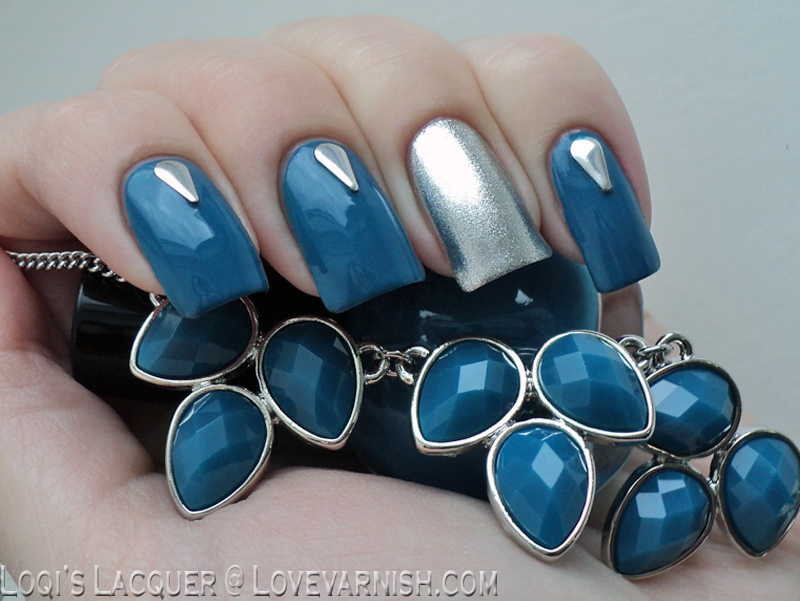 So because the necklace is silver with gorgeous blue stones I thought I would use those colors as the base for my manicure. And as luck would have it, I had a couple of silver teardrop shaped studs that kind of mimicked the shape of the stones! Adding the silver accent nail was easy using Sinful colors Heavy metal. But the blue polish was a bit of a hassle. I had some colors that were similar, but not quite enough. Until my eye fell on a tiny, almost empty, bottle that was hiding between 2 others: Sephora Curacao. This is a pretty ancient bottle of polish, we don't even have a Sephora in the Netherlands anymore (please come back! please!). But it is the perfect shade of blue to match the stones. And alas, now the bottle it empty. I had to work at it really hard to get enough polish to cover everything smoothly. After that I added the studs and a nice coat of topcoat. I really love how this turned out, and I wish I had more of this polish to do it again sometime. I Hope you guys like it too and see you next week!